Writer, director and star Larry Bishop is no stranger to biker movies, having been in a few of the '70s rebel movies with biker flicks like Angel Unchained, and Chrome And Hot Leather. 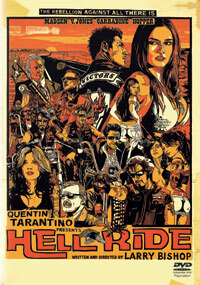 Hell Ride has Quentin Tarantino as executive producer and deals with the decades old rivalry between the Victors and Six Six Six biker gangs. Victors president Pistolero is at the center of it, with Six Six Six leaders Deuce and Billy Wings responsible for the brutal death of a woman Pistolero was involved with in the mid-'70s. Many secrets get revealed, double crossing and killing goes down, all to the tune of a Tarantino-esque soundtrack and many hot naked women in biker bars. With outlaw ethics, biker brotherhood and road justice playing a big role, this movie does not take itself too seriously, and ends up much better for it. David Carradine makes a welcome turn (and like Crank II it is sad seeing him, knowing there will be no new movies featuring him). It's was good to see Easy Rider legend Dennis Hopper out on a bike again, albeit a sidecar! And sadly, a few week after seeing this, news came of Hopper's death - like Carradine, he will be sorely missed.